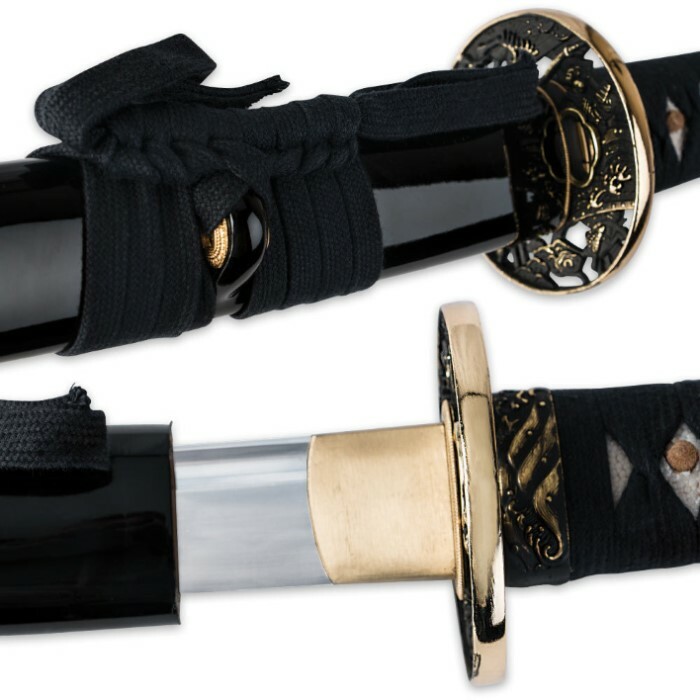 Samurai Musashi Clay Tempered Katana Sword | BUDK.com - Knives & Swords At The Lowest Prices! 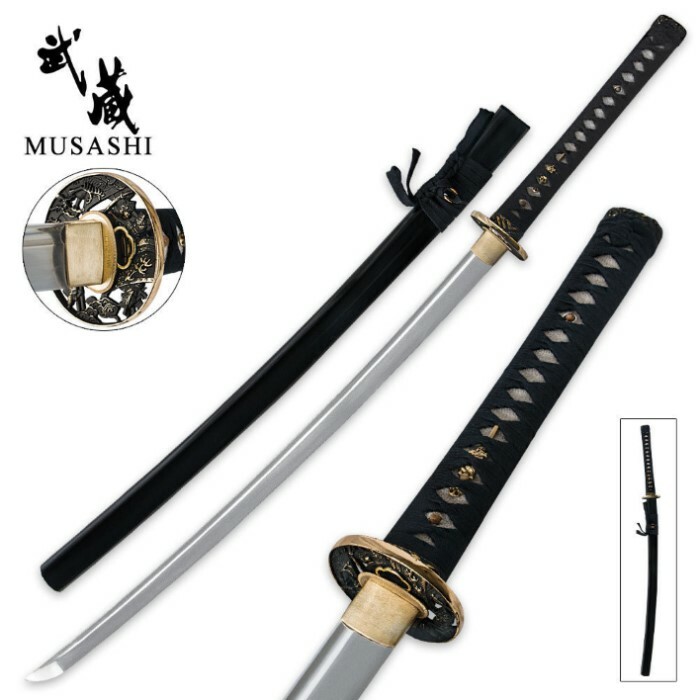 This stunning handmade Musashi Samurai Sword features a hand-forged 1060 carbon steel blade that was made using age-old clay tempering techniques, resulting in a beautiful, fully functional sword. Authentic details such as the antique-finished tsuba add elegance to this historic piece. The handle offers genuine ray skin with cord wrappings. Includes a hand painted hardwood scabbard. 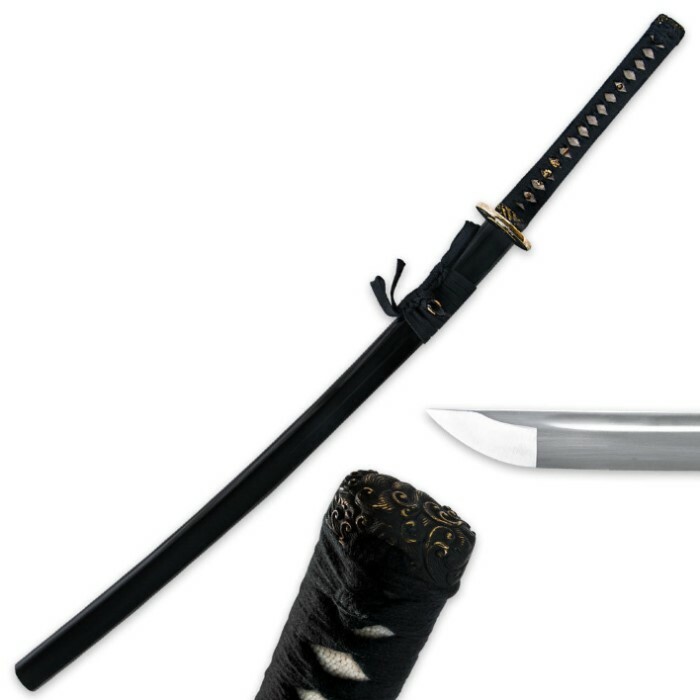 This sword is a outstanding blade for the price, the durability, the sharpness, the looks and the quality are all really nice on this katana if you want a dope sword for under 100$ this is it. I have not received this sword yet, but I saw it when I went to a friends house, and I was pretty impressed that you could get a sword of this quality for this kind of price. A very good common man home defense weapon, or display piece I must say. I am excited and can not wait for delevery! Wow nothing Feels Like Holding a Real Katana in your Hand! Nothing! and this sword is EXTREMELY RAZOR SHARP! Amazing Craftsmanship all around! and the weight is real! definitely wasn't expecting it to be as heavy as it is because i train with Bokken swords but this probably twice as heavy & twice as fun! All I can say is WOW!! Well made and absolutely amazing. It is everything I hoped for and more. I could hardly wight to get off work and see it up close. Very impressed with the quality for this sword. Everything is tight and well fitted. Ultra sharp. Would be hard pressed to beat at $80. Get the sword cleaning kit, it is a must have. Shipping time from True Swords was right at 30 hrs. Whoa that is fast. Received this sword about two weeks ago, and trust me, the reviews do not do it justice. I own several swords but this one puts them all to shame. Well constructed, well balanced, sharp as hell, and came well oiled. The hamon is flawless and the details are amazing. Can't say enough about it....For the price, you will not find a better deal than True Swords. Highest rating is a 5...This one deserves a 10. Support team is great, hands down. Thank you all....will be a repeate customer. I bought this beautiful sword and two days later it was at my door. Its a wonderful sword with tight fittings and a beautiful hamon. Only thing I thought could have been better was the sharpness but overall a great buy for the price! Ill buy another. great sword, came in 3 days. i can cut trees under 3 inches thick in 1 swing! GREAT BUY!